St. Pete Mayor Rick Kriseman. St. Petersburg will not take 29 police officers off the street and place them in elementary schools. The city – following suit with Hillsborough and Pinellas counties - will instead hire armed security guards. A new state law mandates armed and trained officers in every public school, but does not fund the requirement. The law was passed in March, one month after the Marjory Stoneman Douglas High School shooting that killed 17 people in Parkland, FL. Those officers would have cost St. Pete more than $3 million, according to Police Chief Tony Holloway. The police department already places officers in several middle and high schools, but not elementary schools. 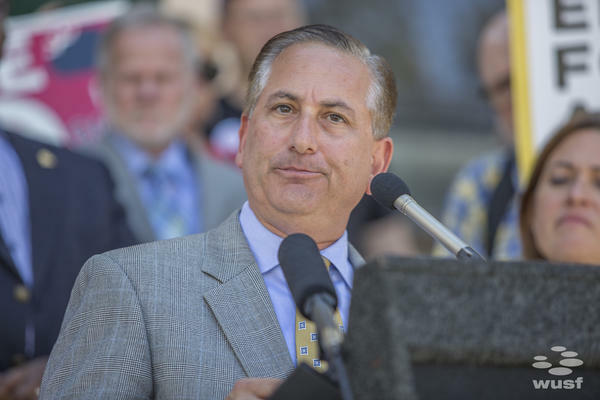 Mayor Rick Kriseman decided to keep it that way. "After presenting all the recommendations to the mayor, he came back with the plan that we'd stay in the middle schools and high schools, but the school board would have to move forward with the guardian program,” Holloway said. While those 29 officers won’t be pulled from the street as originally planned, St. Pete will still provide another two officers to St. Petersburg High School and Northeast High School, and a third officer to float among schools. Holloway said it’s best not to take officers from the gang unit and out of communities where they've established trust. The school district will instead hire armed security guards – called Guardians - through the state's Coach Aaron Feis Guardian Program, named after the late Stoneman Douglas assistant football coach who died protecting students at the school. The police chief said the city got a lot of calls and emails from community leaders voicing concerns about removing officers from their beats to staff elementary schools. "Through our community service program, those officers have formed a bond with those communities and they just felt if those officers leave their community, that they would lose that contact and they relationship they've built with the community would go away,” Holloway said. The school guardians will be trained by the Pinellas Country Sheriff's Office. They will not have the authority to make arrests. Holloway said a meeting Wednesday between the Sheriff and other Pinellas County police chiefs will hash out the details.